No matter which water sport you are partaking in, having high quality foot protection will prove immensely valuable. Having the best water socks will ensure that your feet stay warm and help protect your feet on the walk to the water including the rough rocks in shallow waters. In colder climates this becomes even more valuable. The best neoprene socks are important, that is why we have compiled our top five favourites on the market. From size 6-16, there are a pair of these comfortable neoprene socks for everyone. These socks are perfect for surfers or paddleboarders as they have honeycomb silkscreen bottom that gives you more traction. This does not compromise comfort but does provide you even more security to keep you from slipping when walking on rocks. The seams on this sock are blindstitched to lay flat against your skin and avoid chafing and are glued for a tight close that prevents water from seeping through. A comfortable 3mm of thickness protects you from the cold water while not restricting your movement. These are so comfortable they can even be used as a liner for hunting or hiking shoes. Made using a high quality durable material, these socks are making them easy to get into and perfect for wearing with scuba fins. These ankle high socks come in seven different fun colors with designs to show your personality, even under the sea. With the high quality finishing this sock has you would never guess that it holds such an affordable price. The construction is top of the line with blindstitched seams that provide superior comfort against your skin. With glued seams this sock is not only durable but it is strong enough to keep the water out making you even warmer in the water. The ideal 3mm thickness keeps you comfortable in cooler waters without giving you a bulky feel. The sole of this sock is comprised of a dotted silkscreen material that gives you added traction when walking. That makes this sock great for virtually any water sport. Four-way stretchable material makes slipping this sock on and off easier than ever. It is no wonder this made our list of top rated aqua socks, this sock offers something for everyone. Coming in over 10 different styles and ranging in sizes from 4-15 this is the perfect sock to fit the whole family. An adjustable ankle cuff allows you to get the perfect fit and keeps the sock firmly in place allowing you to focus on playing at the beach. This sock is built as a beach sock and is the perfect accessory for playing soccer, volleyball or any other sport on the hot sand. Built to withstand the hot sand these socks are great for swimming, snorkeling as well as on land playing. A stretchy and comfortable design allows them to be easily worn for the whole day. A great way to protect your feet from hot or rocky sand, blisters and sunburn. These high top sand socks are a must have for your next family vacation. These low riding thin socks come in at an unbeatable price making them a great option for water sports. Their lightweight design makes traveling easy while their non-slip sole allows you added security and versatility. 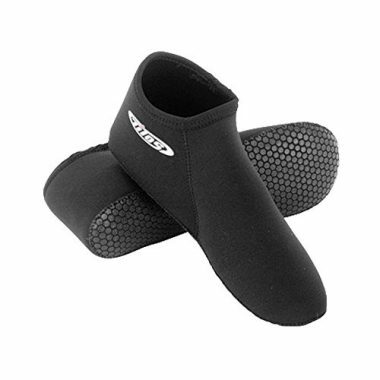 The low profile design allows them to easily fit into full foot fins making these a great pair of water socks for snorkeling or scuba diving. Not only used in the water, these thinner neoprene socks can be used in hunting or hiking shoes to give your foot added insulation. The thinnest pair on our list, these socks are ideal for warmer waters giving you the perfect combination of warmth and protection. A wide range of sizes and five different colors to choose from makes this one of the top water socks for swimming. This sock sits so comfortably it begins to feel like a second skin. An adjustable ankle cuff makes these mid rise socks an even more perfect for the whole family. Made using a lightweight and stretchy lycra material makes getting into this sock very easy. A tough and durable neoprene sole provides added protection for your foot making this sock great for both in water and on sand playing. Your feet will no longer face sunburns or blisters from hot sand on a sunny day. There are many things you should consider before getting yourself a pair of water socks. Not only the material and build quality but also the time and place you use these socks are important things to consider. Water socks are different from water shoes in many ways. Water socks are usually designed using a latex material and have a much closer mold to your foot. Socks also lack the thick sole and rigid upper that a water shoe will have. The lack of sole means that water socks are best used in instances of low-impact and intensity. Typically these will be used in public pools for things such as water aerobics, saunas and showers. 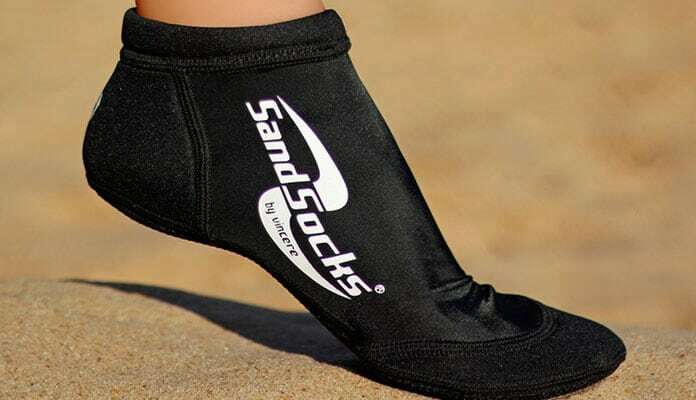 Due to the full protection the provide your foot they are also commonly worn at the beach. While they do not provide protection from sharp objects such as rocks, they will protect you from hot sand and any bacterial environments. 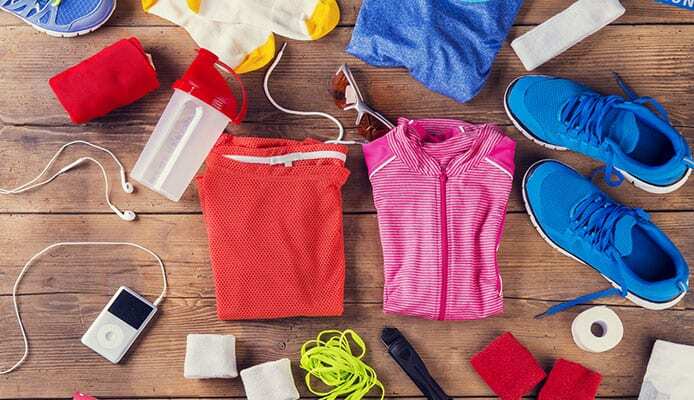 As with any article of clothing you choose to wear in the water, paying attention to the types of materials used to make your water socks is important. When placed in the water a lot of materials retain the water and end up feeling quite cold and heavy. In cooler conditions, this could be life threatening. Typically natural fabrics are the ones to retain all moisture. Going for a synthetic material will give you a lightweight material that has a more rapid dry. When considering leather, real leather is more durable but damages easily in the water and is far heavier. Synthetic leather on the other hand is more durable in wet conditions and has a much lighter weight. We prefer these synthetic materials. Companies spend time and energy designing the best type of materials for their products. This system allows them to do the hard work to find out which material, and build quality, are best in certain situations. Water socks are generally known for having a weak sole. Designed for situations that are not of high impact water socks focus more on a lightweight design rather than a bulkier sole. With that being said, many outdoors adventurers are turning to a more barefoot style of shoe. Going for a water sock with a slightly thicker sole could be all you need in order to transition your socks from lounging at the pool to exploring on a hike. Thicker soles have many advantages. Offering superior traction and durability makes this option quite attractive. Many people looking for the increased durability and protection may want to consider water shoes as an alternative. For those looking to primarily sit poolside or spend their day in the water, having a thinner sole will likely be a much better option. The flexibility and lightweight design of this model can be infinitely more beneficial. You have the most flexibility when it comes to activities that don’t require tons of walking around. It is important to consider your usage before deciding on the thickness and type of sole that will be best for you in your shoe. Usually the more padding a sock has the less stable they become. This is due to their squishy nature. If you are needing the most stability you can get you may have to sacrifice a little bit of comfort. This isn’t to say that the sock will be uncomfortable, just less than a sock that’s made for simply short walks to the beach. Water socks need to have the most ventilation they can get. This is what makes them so great at drying quickly. This also allows your foot to breathe while you’re on big hikes. If your water sock didn’t have good ventilation you would find your foot would stay wet from sweat or water longer than you wanted. This can be done through the material used in the water socks construction. A mixture of mesh and breathable fabric will be the best combination you can get. The sole should also have drain holes to prevent water from pooling and accumulating at the bottom of your shoe. It doesn’t matter how well the top part of your water sock is at ventilation if the sole of the shoe doesn’t have the same feature. This is one of the main ways water socks get rid of most of the water that enters the shoe. The sole of the shoe will be where most of the water exits the shoe. Some water socks have specially designed one way valves on the bottom of the shoe that lets water out while not letting sand and other debris in. We find these systems to be the best. If your shoe lets sand or rocks into your shoe your feet will be sore and you won’t want to wear the shoes any more. What good is a water sock if it isn’t stable. You’re going to be balancing on sharp rocks or hiking through the forest – you will need gear that has a stable base. This is largely to do with the base of the shoe. Some companies will trade cushioning for stability. This isn’t ideal as you will want a combination of both. If the sock isn’t comfortable it can hurt your foot and even cause blisters and significant discomfort. It’s important for the water socks to have cushioning that also supports the arches of your foot. If you are going on a longer hike you will want one that has arch support throughout the sole. You won’t want to add an insole as it can act as a sponge, ultimately defeating the entire purpose of the water sock. Water socks need to fit your foot almost perfectly. If they are too small you will find that your foot feels cramped and pinched. You will also experience discomfort if they are too big. Your foot will move around in the sock and cause friction and blisters. 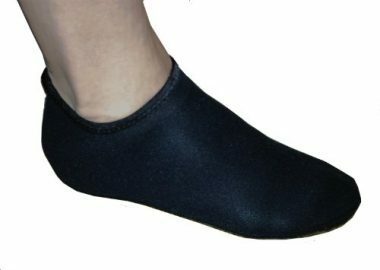 The perfect size water sock will hold your foot in place without constricting or rubbing your skin. When looking at the size of the water sock it is important to consider the padding on the sole. This can cause the sock to fit differently and feel more comfortable. The cushioning can also be tailored to the activity you’re doing. For example, if you’re more of a runner you will want the padding to be near the bridge of your foot. All of this doesn’t matter if the water socks don’t last. They need to be made of material that is strong and able to stand up to the conditions you put them in. If you are a hiker for example, you will want to look for socks that have a more robust material than if you were needing them to simply walk along the beach. The build quality is also vastly important. Stitching can affect everything from the longevity to the feel of the socks. The way in which the padding is added will also make the socks more or less durable. 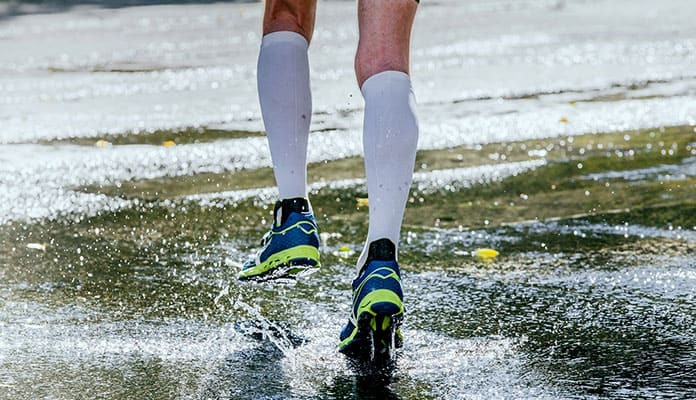 Q: What Is The Difference Between Water Socks And Water Shoes? 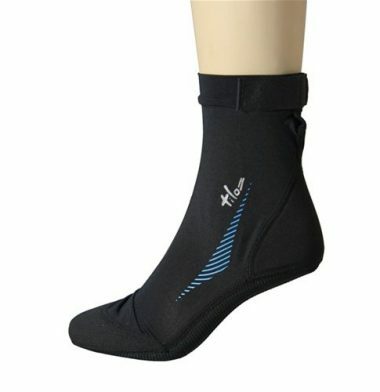 A: Water socks are essential socks that have been specially designed to be worn in water. This means they won’t rub and cause blisters as normal socks that get wet would. These socks don’t offer as much protection as water shoes but are great when worn in combination with scuba fins and water shoes. Water shoes, on the other hand, have been designed protect the feet. They will have a comfortable insole that doesn’t retain water while being able to be worn for long hikes. Their tread will usually have drain holes that let water easily flow through without flooding in your shoes. Q: How Should Water Socks Fit? A: Your water socks should fit quite snug. You should be able to get them on without too much of a struggle while having them tight enough to stay up. You will want to ensure the heel of the sock fits in place on your foot. If your sock is too loose and does not fit your foot tightly then it will absorb a lot of water and end up weighing you down. On the other hand, if they are too tight they will stretch out and not offer as much protection. This will greatly decrease the lifespan of your socks. Q: How To Clean Water Socks? A: Many people mistakenly think that if they are using their water shoes in fresh water they do not need to clean them afterward. The reality is that freshwater sources such as lakes still have a ton of microbes in them. These can wreak havoc on your gear by causing mildew to grow. Luckily cleaning your socks is quick and easy. You can simply rinse with fresh water from a hose and air dry out of direct sunlight. In some cases, these can start to stink and a simple rinse will not do. When a deeper clean is needed you can rinse with some mild soapy water such as wetsuit shampoo. You can also use some vinegar to help remove the smell. Dump all the water out and stuff some hand towels into the boot to soak up any added moisture. You may want to speed the drying process up by using a blow dryer for inside the shoe. Q: What Are Water Socks? 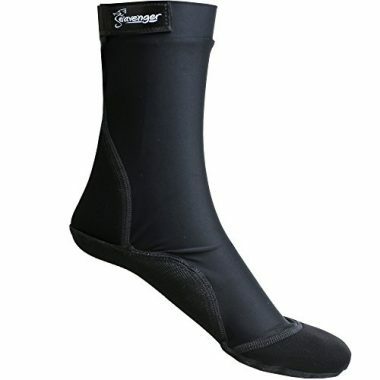 A: Water socks are lightweight foot protection that is made out of the same neoprene material as wetsuits. There are many different kinds, some featuring minor tread while others have thick rubber soles that provide lots of traction. These are used by many water enthusiasts including surfers, scuba divers and beach loungers. The flexibility offered in these shoes is incredibly ideal but they do not provide enough support for long term activities such as hiking. Q: How Do I Choose The Best Waterproof Socks? A: There are many factors that make great water socks. This is a combination of materials, design and feel. Water socks should have a material that drys quickly while feeling light. They should also have flatlock seams which nearly eliminates bunching and friction which cause blisters and discomfort. 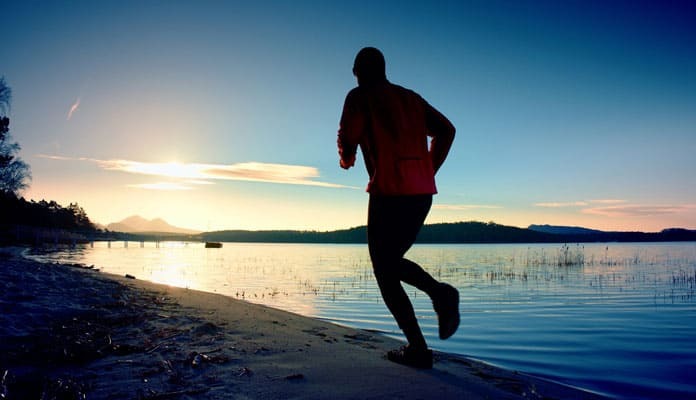 The thickness can also help keep your feet warm if you’re swimming in colder climates. Q: Where Should I Buy Water Absorbent Socks? A: More and more places are selling absorbent socks. Buying your aqua socks online is a great way to ensure that you get the best price point. Most outdoor department stores now carry this preferred form of footwear. You will also be able to find them at your local dive shop as they are commonly used with snorkeling fins. Q: What Water Sock Work Best In Submerged Water? A: All water socks will work great when submerged in water. After all, that’s what they’re designed to do. If you think that water socks will keep your feet dry you will be surprised to learn that this is not what they do. They give you the grip and protection your feet need to walk on rocky shore especially in the ocean. You can use this type of shoe in many different situations ranging from hiking to boating to running and even whitewater rafting. They will not only protect your feet but dry exceptionally quickly. They won’t retain water like normal running shoes will. Instead, they have drain holes and material that has built in quick dry systems. Q: Do I Wear Water Socks With Water Shoes? A: This is a tricky question. Water socks aren’t typical socks you wear under shoes. These are essentially water shoes just thinner and slightly different. You won’t have to wear water shoes over these socks as they are enough protection for your feet. If you find some thin water sock you can wear them with water shoes. We recommend only doing this for hikes or longer walks. Water shoes are meant to be comfortable enough to wear without socks. The extra material will also slow down the drying time. Q: What Is Neoprene Socks? A: Neoprene socks are traditional style socks with a flair. They are made from neoprene, a material that can not only withstand the abuse of hiking, river passings and even skiing. These socks are exceptionally fast at drying while being warm and ultralightweight. Water seems to simply roll off them without being absorbed at all. 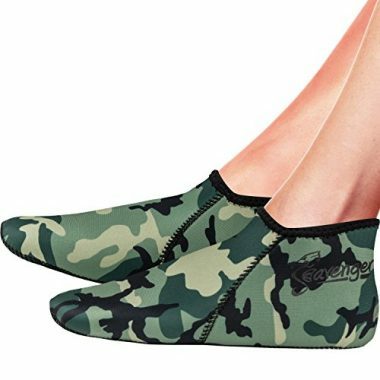 You can wear them between water shoes and your skin to protect against friction and rubbing on longer hikes. Having this extra waterproof barrier will make your feet happy for longer. You won’t have to worry about blisters or waterlogged feet any longer with neoprene socks. Having a trusted pair of water socks is something that any water enthusiast needs. Water socks reviews agree that having high quality foot protection is important in ensuring you get the most out of your day at the beach. Protecting you from the hot sand into the depths of the ocean, water socks are an affordable way to keep you protected. Did your favorite pair of water socks make our list? Let us know what you look for in your perfect pair of water socks below.